This time of year it's easy to get run down. With all the bustle it can be an exciting, family and friends filled time or the opposite, maybe a difficult time because of a loss or other circumstances. Either way, yoga can help you protect your energy and provide you with a practice that wakes up your body and your mind and provide you with sustainable energy throughout the day - no matter how you feel about this season. 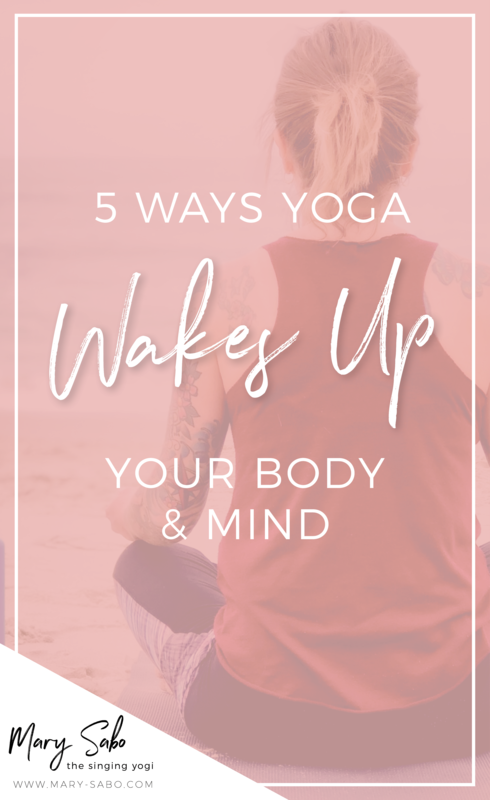 Here are five ways yoga wakes up your body and your mind. Breathing is something that we all do naturally because we have to breathe to live. But mindful breathing is breathing on a whole new level because it allows you to shift your mind and body into a calm state. Deep breathing engages the abdominal muscles and diaphragm, for example, which stimulates the parasympathetic nervous system, slowing down your heart rate, lowering your blood pressure and increasing oxygen to your cells. The positive effects of mindful breathing are physiological as well as psychological. Controlled breathing has also been shown to improve mood, increase stamina and promote healing. In fact, one study found that menopausal women who practiced Sudarshan Kriya Yoga (SKY) every day had higher levels of cell-protecting antioxidants in their bodies than women receiving HRT treatment. Yoga is a great way to strengthen your core, and improve your posture and coordination — it may even help to reverse bone loss. A psychiatrist at Columbia University, Dr. Fishman, carried out research to find out if yoga might be an effective therapy for osteoporosis sufferers. His ten-year experiment revealed that yoga may prevent spinal fractures and other bone injuries in those with osteoporosis because it improves practitioners' posture and coordination. It appears that the ability to stay upright and not fall reduces the risk of having a serious fracture. If yoga can help those who have fragile bones, then just think about what it could do for people with normal bone mass. The modern age ensures that your brain is busier than ever before. Every day, you are inundated with information, which can lead to sensory overload and reduced concentration over time. Yoga gives your mind the chance to be still, helping to improve your focus and concentration by calming the mind and eliminating distracting thoughts. A recent study carried out at the University of Illinois found that practicing yoga for just twenty minutes a day can improve brain function. Thirty participants were given two tasks to complete. One task involved identifying shapes on a computer screen. The researchers found that those who practiced yoga performed better on the tasks than those who opted for aerobic exercise or none at all. Over time, prolonged stress can take a toll on your physical health as the stress hormone, cortisol, suppresses your immune system. This can leave you feeling exhausted as your body tries to restore itself. Yoga, on the other hand, will enable you to switch off from your busy schedule and reduce your cortisol levels, leaving you re-energized. Yoga can improve blood circulation without increasing your heart rate. Deep breathing exercises facilitate the flow of blood around the body, improving the venous return to the heart. Standing poses can increase the elasticity of the blood vesicles, making it easier for your blood to pass through them. Yoga has been an exercise of choice for thousands of years. Mindful breathing, stretching poses, and increased flexibility have enabled many yoga enthusiasts to enjoy healthy bodies and minds. Need some inspiration to get started? Download this short energy boosting sequence and keep it handy to give yourself a quick 10-minute reboot anytime you need!